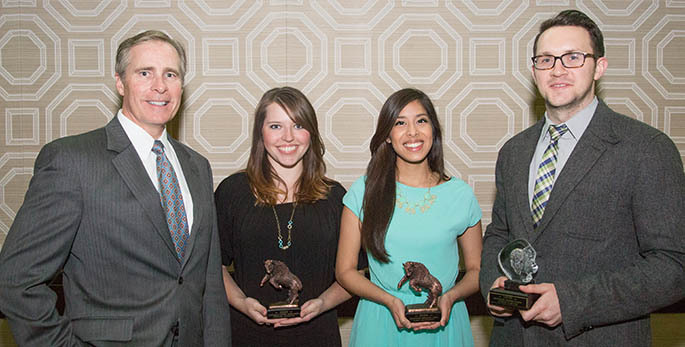 Point Park President Paul Hennigan with: (left to right) Chelsea Behanna, Outstanding Student Leader; Sara Mahmood, Outstanding Graduating Senior; and Justin Karter, Outstanding Graduate Student. 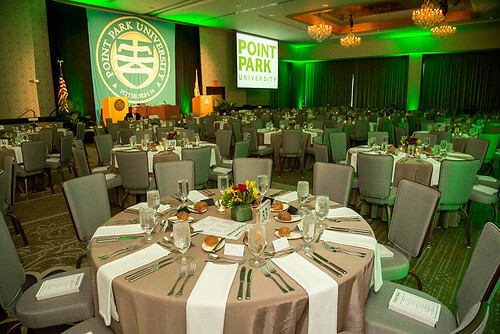 Point Park celebrated the accomplishments of students, both for academic excellence and campus involvement, at a festive dinner to wrap up the 2013-2014 school year. The annual Outstanding Student Awards dinner took place at the Fairmont Hotel in Downtown Pittsburgh on Friday, April 25, with more than 300 students, staff, faculty, friends and family members attending. Outstanding Graduating Senior: Sara Mahmood, elementary education, Silver Spring, Md. Outstanding Graduate Student: Justin Karter, journalism and mass communication and clinical-community psychology, Angola, N.Y. Outstanding Student Leader: Chelsea Behanna, sports, arts and entertainment management, Charleroi, Pa.
At the dinner, guests sat at round tables with a floral centerpiece as they dined on grilled chicken over artichoke and lemon risotto with asparagus on the side. The meal ended with a mini dessert trio, including a fresh fruit tart, vanilla bean crème brulee, and chocolate a-go-go. The crowd watched several videos and slideshows, including a comical scene of J.W. Tabacchi, senior director of student conduct, chasing the Point Park mascot through Downtown Pittsburgh to get an envelope containing the list of award recipients. The video concluded with the bison taking his mask off to be none other than Point Park President Paul Hennigan. At the dinner, Hennigan offered words of wisdom and gratitude to the many graduating seniors taking part in the evening. He shared four tips for continued success after graduation: have confidence; work hard; wake up every day with a goal; and be a life-long learner. "It is up to you now. Have the confidence to know you are an intelligent person," Hennigan told the students. "Get up every day with a goal. Have a sense of direction every day you wake up." Hennigan described many of his own experiences and shared some of the many jobs he has had during his career. He concluded his speech with words of praise for the students. "I am very proud of every person in this room. You embody the Point Park spirit," Hennigan said. Natural Science and Engineering Technology: Richard Nemec, Mechanical Engineering Technology, Wexford, Pa.
Criminal Justice and Intelligence Studies: Lauren Vernail, Intelligence and National Security, Greensburg, Pa.
Education: Sara Mahmood, Elementary Education, Silver Spring, Md. Humanities and Human Sciences: Angela Fullmer, English/Creative Writing, Pittsburgh, Pa.
Accounting, Economics & Finance, Information Technology: Ivan Beric, Accounting, Bethel Park, Pa.
Management: Chad Sanders, Human Resource Management/Capstone, Darlington, Pa.
Sports, Arts and Entertainment Management: Amelia Hackimer, Sports, Arts and Entertainment Management, Glenshaw, Pa. Journalism: Marina Weis, Journalism, Saint Marys, Pa.
Public Relations and Advertising: Abigail Mathieu, Journalism, Wheeling, W. Va. Visual and Interactive: Corrine Volosky, Multimedia, West Mifflin, Pa.
Dance: Megan Meyer, Dance, Chatham, N.J.
Theatre: Lindsey Sherman, Theatre Arts, New City, N.Y.
Cinema: Megan Kuntz, cinema production, Newville, Pa.
Amanda Belfiore, junior, dance, Hazelet, N.J.
Alicia Green, sophomore, journalism, Queens Village, N.Y.
Kathryn Van Yahres, senior, dance, Paoli, Pa.
Adam Niehl, senior, cinema and digital arts, Irwin, Pa. Emerging Leader Award: Jordan Durham, freshman, cinema production, Mountville, Pa. Active in United Student Government and the John P. Harris Society.